I don't think Andy & I can make just one post dedicated to Max's Celebration of Life. It was so perfectly Max. We don't feel there is anything we would've changed had we the opportunity. Something we didn't realize until they were actually being read, was how perfect the books we chose were. See what you think. Here are the stories for those of you not familiar with these childrens' books. his mother called him "WILD THING!" and Max said "I'LL EAT YOU UP!" so he was sent to bed with eating anything. and in and out of weeks and almost over a year to where the wild things are. And when he came to the place where the wild things are they roared their terrible roars and gnashed their terrible teeth and rolled there terrible eyes and showed their terrible claws till Max said "BE STILL!" and tamed them with the magic trick of staring into all their yellow eyes without blinking once and they were frightened and called him the most wild thing of all and made him king of all wild things. "And now, " cried Max, "let the wild rumpus start!" MAX by Bob Graham, is a much longer story. Hannah read it - perfectly by the way! Its the story of a boy born to superhero parents who can't seem to fly, until one day he's faced with a problem that requires him to fly to avoid certain disaster. The question at the end of the story is "Now that Max can fly will be become a superhero like his parents?" His mother says, "Not important. Let's call him a small hero, a small hero doing quiet deeds. The world needs more of these." I think our Max was indeed a small hero. Look what he's done for you and me. I teach junior high English, but I'm going to find a way to work these two beautiful children's stories into an upcoming lesson plan. I hope to teach my students to "Live Life to the Max!" God bless your precious family, and may He hold you firmly in his arms. You have defied death and have shown that it could not bring down the spirit of a cheerful 7 year old and his loving family. Max is resting in peace in heaven. But your battle continues on the earth. Your path still lies ahead, which you have to continue walking without your brave Max on your side. But I have no doubt that, in the years to come, Hanna and Nick will carry on his brother's spirit and help you walk on. Along with your wonderful extended family cheering for you all. Its Kate here, from New Zealand. I recently sent a package of goodies to Max, with a couple of things for Hannah and Nicky as well. When you have a moment in all the chaos I would love for Hannah and Nicky to have all the things sent, in the hope that it they will prove a little distraction in this tough, busy moment. Max touched so many people, and though it was through unfortunate circumstances, it has made me, and my family, on the opposite side of the world, live our life to the Max every day, in memory of your wee miracle. In this way, Max was one of the most amazing heroes ever. He will live on. I saw Deb's pictures from the memorial, and they are awesome. Looking at the list of Warriors and Angels on your blog makes me so sad. Erika and I cruise around to our kids on my bookmarks for their webpages and she was commenting on how many angels we have. It's the same for your list - and how recently too! They are all heros. By the way, we had "warrior princess" inscribed on Katie's headstone. Take care - we are thinking of you! The Celebration of Max's life was absolutely amazing and I truly believe just the way Max would have wanted it. And yes, the books were beyond perfect. Without a doubt, Max was (and always will be) a hero. And you two...are heroes also. Don't forget that! I (and so many others) are better people for knowing Max...for knowing you. Thinking about you so much. Those books really fit Max! Wonderful books. I'm going to have to check them out again at the library so I can read them again. The books were perfect! It's funny, because every time we read 'Where the Wild Things Are' we always think of Max! He used to do this growl when he was little and playing. Hannah did an awesome job of reading too. Andy and Melis...you ARE super heros and Max knew it too. Thank you for sharing Max with all of us. I am deeply touched and blessed to know his story. I cannot comprehend what your family has been through, but I am in awe of your son's courage and strength. He has a loving and devoted family. I just LOVE that quote from the book Max...it is so PERFECT. I'm just so honored to know you both, to have known Max over the past few years, and to have learned so much from watching you all love--and live-- with such intensity. I couldn't attend Max's celebration. Too many miles between CA and VT, but I did let go a Star Wars balloon during your celebration so I could still honor such an amazing guy. CHARMING, WHIMSICAL AND FULL OF LOVE! Thank you for sharing the books, the stories from the celebration and the videos. As someone who doesn't know your family, I love seeing the videos of Max (the pasta one is so cute). I continue to be moved and inspired. Those are our 2 favorite Max books too! What a great tribute to him and it sounds like they captured his personality perfectly. He is such a superhero- an impressive feat at any age, let alone at the tender age of 7. I am sure you are well aware of the number of kids books with Max in the title, but a few other ones Hannah and Nic might like are Max the Minnow (board book), Adventures of Max and Pinky (a series) and Max's dragon. You all continue to be in our thoughts daily. Max has inspired many of us to live life to the Max- he has quite the legacy and amazing parents and siblings to go along with it. i didn't think i had any more tears in me, but hearing about Max brings me such peace. he was and continues to be my hero. i was telling my 4 yr old on the way to school this morning how beautiful she looked and how smart she is. she said yes and i am special. just like that little boy, the one who went to heaven. i said yes, Max is special. i hope you have some grasp on the depths and infinite ways your life w/Max has touched so many. thank you for continuing to share the blessing of Max with others...i look forward to getting these books for my girls. 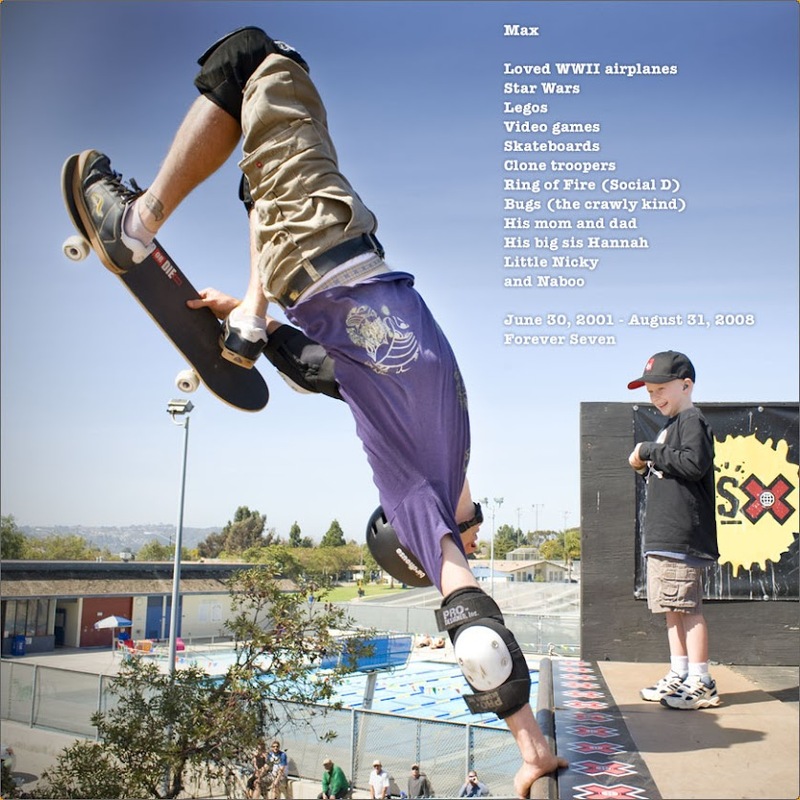 Saturday's celebration of life for Max was so moving, sweet and yet, heartbreaking at the same time. I think of you often and hope that you will soon find peace in the quiet times of your days. You are all such a sweet family. Melissa, it was good to see you at SBPP. Starbucks is just waiting for us. Just wanted to let you know that I still check in on your web page a couple of times a day....not too sure what I am looking for, but I am thinking of you all and pray that Max's sweet spirit surrounds you during the days, weeks, and years that follow. His ceremony looked beautiful and the angel photo that Deb captured was amazing. The celebration of Max's life was perfect. I'm sorry I wasn't able to talk with you, but I know you both were very busy. But we were glad to be there. You two have such incredible strength to go to the ends of earth for your Max. You both are very inspirational! "Some people come into our lives and quickly go. Some stay for a while, leave footprints on our hearts, and we are never, ever the same." I thought & prayed for you all on Saturday - thank you for posting the pictures of the celebration of a wonderful life. I have always loved these Max books. Do you also have the Max and Ruby books, where Max (a bit naughty, but ultimately GOOD) always gets the best of Ruby, who thinks she knows best? I feel lonely without Max, and I never even met him. My son Trevor is Max's same age. I remember well reading Where the Wild Things Are to him when he was 5 or so and tickling him in the ribs when they say "terrible claws" at the end of the book he turned to me and said, "Do the terrible claws again Mommy." Baby boys are so very precious. I'm so sorry for your loss and also so glad to know your son through your blog. Sending all our love from Reno, NV.